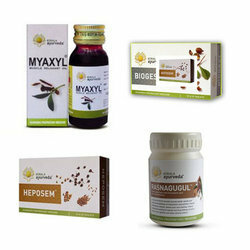 We offer customers a wide variety of carefully formulated and patented Ayurvedic medicines. Available in capsules, tablets and oil form, these include Ajax capsules, Alsactil Tab, Bala Kalpam, Biogest Tab, Brahmi Pearls, Gestatone, Glymin Tab, Heposem syrup, Heposem Tab, Histantin Tab, IClear, Imugest Tab, Iogen syrup, Kesini oil and Laxinol H capsule. 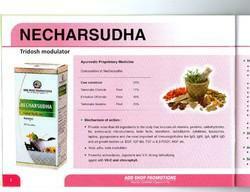 Indication: Spermatorrhoea, general weakness and old age weakness, improves the stamina and vigour. Our organization offers the wide range of healthcare medicines, we offer Blodd Circulation Medicine highly used and in demand for the varius features like immediate relief, less side effects etc. This Tablet has used the alignment of nabhi or naabhi Chakra – in English called as Solar Plexus. The “NAABHI CHAKRA tablet aligns the dislodged Naabhi chakra or solar plexus chakra in the body, through a unique combination of divine herbs. There is no reference to this medicine in any book. For Alignment of nabhi or naabhi Chakra – in English called as Solar Plexus. - A need to improve mental agility, memory and learning in young adults and working professionals. - To prevent age-associated memory problems in the elderly.